Changes in competition program 05.10.2017. Thereasons for the preparation and realization of this Competition are: The decision of the Committee forbuilding Stefan Nemanja Memorialon announcement of the international competition for building Stefan Nemanja Memorial,The decision of the Committee forbuilding Stefan Nemanja Memorialon the announcement of the competition for Stefan Nemanja Memorial by its character public and general to the local artistic public, and calling towards international public and the decision of the City Assembly of Belgrade to build Stefan Nemanja Memorial on the Savski square in Belgrade.The aim of the competition is to get the best solution for Stefan Nemanja Memorial on the New Savski square in Belgrade. The task of the competition and the idea of the artistic solution is to deservingly commemorate one of the most significant Serbian rulers, Stefan Nemanja, the founder of Serbian state in its brightest medieval period, his life, work and importance as the founder of Serbian statehood. 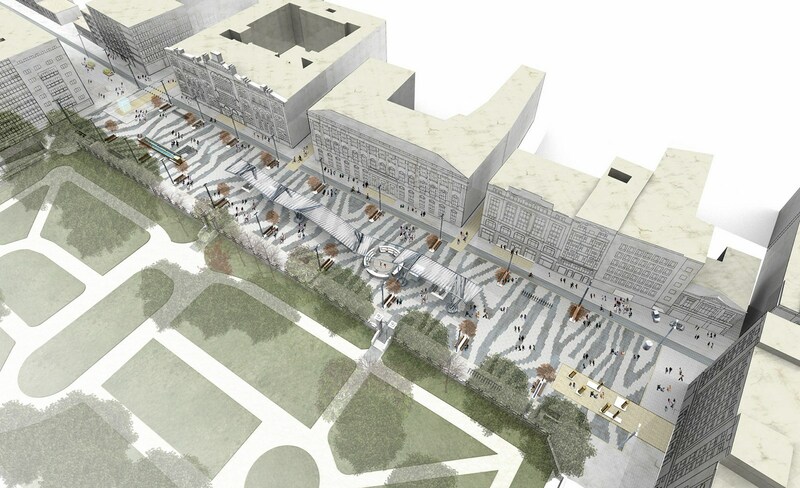 The space in which the Memorial will be placed is a part of the New Savski Square, which, according to the Special-purpose-area Spatial Plan for arrangement of the coastal area of the city of Belgrade - the area of the Sava Riverside for the project "Belgrade Waterfront", should become a public pedestrian area (with tram traffic) which is a whole with the building of the Main Railway Station, planned for a complex intended for cultural activities, the arrangement of which will be defined on the basis of a public urban - architectural competition planned for announcement during this competition. It is expected that the Memorial should be a sculpture work - figuration. The competition is public and a call. According to the participants, the competition is open. By its form, the competition is two-step. According to the method and submission of the work, the contest is anonymous (in the first and second stage). The language of the competition for Serbian participants is Serbian and for foreign participants English. Tender documentation is available for download at the web portal of the City Administration of Belgrade - Secretariat for Culture www.beograd.rs and the website of the Association of Architects of Serbia www.u-a-s.rs from September 27th. By delivery of work, invited participants in the competition (the competition has public and calling character), are entitled for compensation in the net amount of 5 000 €. In case that invited participant wins some of the prizes, the amount foreseen for the award shall reduce by the amount of compensation. If there are at least 10 (ten) works corresponding to the proposals for the second stage of competition, 6 (six) works will be selected. Selected participants for the second stage of the competition, with the delivery of work, acquire the right to compensation in the net amount of 100 000 dinars. The best work will be approved for realization. Belgrade Association of Architects is a voluntary, non-governmental, non-profit, professional, scientific, interest, professional, non-political organization of scientist and experts in the fields of architecture, founded upon the freedom of association, open for cooperation with other professional, scientific, commercial and other organizations on grounds of mutual respect, recognition and independency of work, established for the purpose of achieving joint and common interests. The Association of Belgrade Architects (ABA) was founded on June, 26th 1960, although its unofficial work dates from 1946, just after the World War II had ended. This initiative appeared as a necessity and enthusiasm of architecture community which wanted to participate in architectural renewal of devastated country. As the core organization for architects, ABA has been the leader organization in architectural community in the past 50 years. Numerous projects, architectural and urban design competitions performed and conducted by ABA justify its current position in the architectural community of Central and Eastern Europe (CEE). Throughout the years, prominent practicing architects and university professors were in charge of promoting and improving the work of ABA by actively participating in its activities, which earned its status in the architectural and engineering community, first in the Former Republic of Yugoslavia, and today in Republic of Serbia. As today Serbia is leaning towards its membership in EU, ABA is supporting this goal with numerous initiatives of international cooperation with European architecture associations and many European architectural offices. Belgrade Association of Architects is constitutive member of The Union of Architects of Serbia which is a union of local and regional associations and organizations of architects operating on the territory of the Republic of Serbia. The Union of Architects of Serbia is a member of International Union of Architects (UIA) and observer member of Architects' Council of Europe (ACE). Association of Belgrade Architects is constantly working on promotion of young architectural teams and individuals in order to renew and strengthen architectural community of Serbia for the future decades. These activities are recognized and supported by the City of Belgrade, University of Belgrade, various governmental institutions and embassies along with their cultural centres. As from the very beginning of ABAs work, eminent academics and practicing architecture were involved in the managing of ABA. This unwritten rule gave ABA the possibility to be involved in current architectural practice with significant influence and also informed about the current curriculum and teaching methods at the Faculty of Architecture – University of Belgrade. This practice has been proved as fruitful, it made it possibile to map, mark and connect professional and academic architectural community into a network. It also gave Association of Belgrade Architects the status of trustworthiness and relevancy in international architectural community. Association of Belgrade Architects cooperates with numerous city institutions, such as: Belgrade Land Development Public Agency; Urban Planning Institute of Belgrade; Office of the Lead City Architect; Faculty of Architecture, Belgrade University; Institute for Protection of Cultural Heritage; Institute for Protection of Cultural Heritage of the Republic of Serbia; Ministry of Construction and Urban Planning of the Republic of Serbia; Belgrade Cultural Centre; Chamber of Engineering of Serbia; different embassies and cultural centres (Italy, Germany, France, Poland, Austria, Great Britain, Netherlands, Norway, USA, etc. ); numerous architect associations, locally and abroad (Rome, Warsaw, Tokyo, Moscow, Budapest, Ljubljana, Skopje, Sofia, Vienna, Prague, etc. ); business companies and project organizations. ABA members are expert advisors in many companies. ABA members also are sitting in different city committees: committees for elaboration, committees for plan design, etc. A multimedia cultural event involving exhibitions, lectures, workshops, forums, architecture walks, film screenings, specialist seminars and conferences, and project competitions for young architects; reflecting contemporary architecture trends in the local and international scene and establishing a dialogue between the guest and the host architects. The objective of this international multimedia event is to introduce architecture and bring it closer to the general public in the country, most specifically to the citizens of Belgrade. The event is co-organized by the Association of Belgrade Architects and Belgrade Cultural Centre. By this day, there have been eight BINA-s, every year from 2006 to 2013, held in few locations such: Belgrade Cultural Centre, Faculty of Architecture - University of Belgrade, galleries Progres and OZON, Austrian Cultural Forum Belgrade and other locations around the city. BINA was the laureate of the 2008 RANKO RADOVIĆ Award for multimedia approach and program organization. BINA had a tremendous echo in the public and the media, which added it to the list of most prominent cultural events of Belgrade such are Bitef, Bemus, Fest and Belgrade Design Week. After these seven years it enlisted a large faithful audience and a considerable reputation among architects. As a recent addition to the project, web site www.bina.rs serves as a media to quickly communicate with broader audience. Do.co.mo.mo. Serbia is the national chapter of international working party Do.co.mo.mo. International (www.docomomo.com/index.htm), an organization working on protection and preservation of buildings and sites that belong to modern movement in architecture. Do.co.mo.mo. is an acronym derived from english words „DOcumentation andCOnservation of buildings, sites and neighborhoods of the MOdern MOvement“. Do.co.mo.mo. International was initiated in 1988 in Netherlands, as a reaction of professionals provoked by rapid devastation and disappearance of many modern architecture masterpieces all over the world. Today there are 55 national working parties all over the world, with more than 2000 members, and many regional chapters and comities. Do.co.mo.mo. Serbia is from 2010 registered as a section of Association of Belgrade Architects (ABA), as a national working party assembling professionals – architects, conservators and art and architecture historians, working on matter of modern movement in architecture and urban design in Serbia. Do.co.mo.mo. Serbia is open to all forms of collaborations with individuals, groups and institutions, while working on projects and fulfilling the aims of the national chapter. Mission of Do.co.mo.mo. Serbia is to work on educating the general public and to popularize modern architecture in Serbia, as well as presentation of the national modern architecture to international public. Do.co.mo.mo. Serbia is also working on the improvement and active exchange of knowledge in the field of conservation, documentation and presentation of MoMo architecture. Organization, preparation, announcing and implementation of architecture and urban design competitions is one of the most important Association of Belgrade Architects activities. All competitions are accompanied by exhibitions, panel discussions and the printed catalogues. In the past few years, ABA has organized several important open competitions on an international level, for some of the most important city locations and neighbourhoods. Affirming urban spaces and preparing documents for future investors. We submit our proposals annually to the Belgrade Land Development Public Agency, following with the formulated plans for cooperation in new locations. Topical city areas, field work, including involvement of professors such as at the Petnica** Summer School of Architecture, guided expert tours and workshops. Architectural praxis in the summer at architectural studios abroad aimed at obtaining more varied professional experience. ABA is directly involved in the operation of the Planning Committee, and is submitting its expert opinions regarding town-planning concepts and elaborations. Written opinions are delivered to the Secretariat for Urbanism, and then discussed at the public viewings. Committees for issuing expert opinions regarding copyright has processed over one hundred cases during the mandate of the last Management Board, including some which in fact constitute requests for arbitration opinion. Responding to the letters that it received, ABA offers peer assistance to many of its members. ABA initiated the motion to declare the Army General Staff a CULTURAL MONUMENT. Tanja Damljanović and her team, assisted by the Deputy Minister of Culture of the Republic of Serbia Miladin Lukić implemented this initiative of the ABA Management Board. ABA launched initiative to place memorial plaques on walls of the works of the deceased architects, marking their works or their homes. The initiative was launched jointly with the Institute for Protection of Cultural Heritage Monuments of the City of Belgrade, specifically with Mrs. Vera Pavlović and Mrs. Ivanka Raspopović. ABA organizes a great number of presentations of civil engineering and architectural portfolios of various local and foreign companies, products, equipment and furniture. ABA also cooperated with all daily papers and weekly papers, as well as the following architecture magazines: Enterijer, Ambijenti, AG Magazin, New Moment, Kvart. In last two years, ABA also redesigned its website and opened portals on Facebook, also established a quarterly newsletter that is distributed to the large architectural public. ABA incorporates a copy right agency, offering services to ABA members, in reference to demanding payment of authors’ fees for elaboration of concepts and projects, as well as for supervisory architect role. ABA signed Protocols for Cooperation with Roma Association of Architects and the Moscow Association of Architects, and extended the standing Protocol for Cooperation with the Warsaw Association of Architects. BINA Project ensures vibrant international contacts and cooperation. Through this project, ABA cooperates with numerous foreign cultural centres, architectural studios and academic organisations all over the world. Numerous foreign architects used BINA to exchange their experiences, knowledge and points of view with the local architects. *Društvo arhitekata Beograda, DAB - the Association of Belgrade Architects, ABA. **Petnica – International summer science camp, in Valjevo, Serbia.